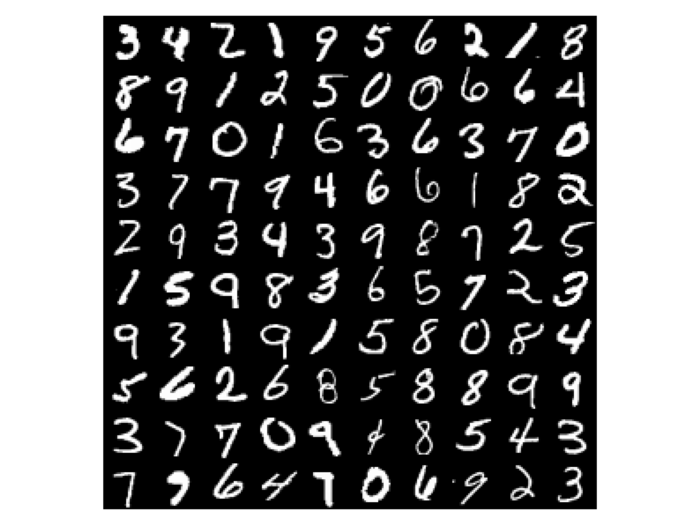 A standard benchmark for neural network classification is the MNIST digits dataset, a set of 70,000 28×28 images of hand-written digits. Each MNIST digit is labeled with the correct digit class (0, 1, ... 9). This example shows how to use theanets to create and train a model that can perform this task. Networks for classification map a layer of continuous-valued inputs, through one or more hidden layers, to an output layer that is activated through the softmax function. The softmax generates output that can be treated as a categorical distribution over the digit labels given the input image. Now that you know which model to use for this task, you’ll need to define some hyperparameters that determine the structure of your network. The most important of these is choosing a set of layer sizes that you want in your model. The first (“input”) and last (“output”) layers in your network must match the size of the data you’ll be providing. For an MNIST classification task, this means your network must have 784 inputs (one for each image pixel) and 10 outputs (one for each class). Between the input and output layers, on the other hand, can be any number of so-called “hidden” layers, in almost any configuration. Models with more than about two hidden layers are commonly called “deep” models and have been quite popular recently due to their success on a variety of difficult machine learning problems. For now, though, to keep things simple, let’s start out with a model that just has one hidden layer with 100 units. This is all that’s required to get started. There are many different hyperparameters that can also be useful when constructing a model; see Creating a Model for more information. Particularly useful to know will be the different ways of creating layers; see Specifying Layers for details. In theanets, the parameters of a model are initialized randomly. To improve the model’s performance on the task, you’ll need to train the model parameters. This training process requires a dataset to compute gradient and loss function values. In the case of the MNIST digits, our classifier model will consume a dataset consisting of two parts—”samples” (image pixels) and corresponding “labels” (integer class values). Each of these parts is provided as a numpy array: the samples are a two-dimensional array, with vectorized MNIST pixels arranged along the first axis and pixel data arranged along the second axis; the labels are a one-dimensional array, with one integer value per MNIST image. mnist.meta  # trigger download if needed. train_images = arr('train_images', 'f') / 255.
test_images = arr('test_images', 'f') / 255. Here we’ve rescaled the image data so that each pixel lies in the interval [0, 1] instead of the default [0, 255]. (In general, it’s a good idea to standardize the data for your problem so that each dimension has approximately the same scale.) We’ve also reshaped the data as described above. Because theanets uses Theano for its computations, most datasets need to be cast to a value that is compatible with your setting for Theano’s “floatX” configuration parameter. Unless you have a really expensive GPU, this is likely to mean that you need to use 32-bit floats. The load function returns a training split (the first 50000 examples), a validation split (the remainder of the training data from skdata, containing 10000 examples), and a test split (the test split from skdata, containing 10000 examples). The training dataset is used to compute parameter updates, and the validation dataset is used to determine when the model has stopped improving during training. There are other ways to provide data to your model during training; for a more complete description, see Providing Data. Now that you have a model and some data, you’re ready to train the model so that it performs the classification task as well as possible. Models are set up to handle training with fairly little work. The first positional argument to this method is the training dataset, and the second (if provided) is a validation dataset. If a validation dataset is not provided, the training dataset will be used for validation. The algo keyword argument specifies an algorithm to use for training. If you do not provide a value for this argument, RMSProp is currently used as the default training algorithm. Any subsequent keyword arguments will be passed to the training algorithm; these arguments typically specify hyperparameters of the algorithm like the learning rate and so forth. The available training methods are described in Trainers; here we’ve specified Nesterov’s Accelerated Gradient, a type of stochastic gradient descent with momentum. In this example, the weights in layer 1 connect the inputs to the first hidden layer; these weights have one column of 784 values for each hidden node in the network, so we can iterate over the transpose and put each column—properly reshaped—into a giant image. For more information on the things you can do with a model, see Using a Model.